Meta Tags, Keyword Selection, Inbound Links, Custom Website Design & More. Take every advantage of the internet and the millions of searches occurring every day! We will optimize your website with effective keyword rich pages and meta-tags. Improve your PageRank and move your website up the search results page. Take control of your online marketing strategy and surpass competition in your industry. Tailor your online office with highly searched keywords and phrases. Intelligently drive visitors to your products and services. SEO (Search Engine Optimization) has two forms, on page and off page. The general goal of each approach is the same, to increase the rank and position of your website on search engine results pages. 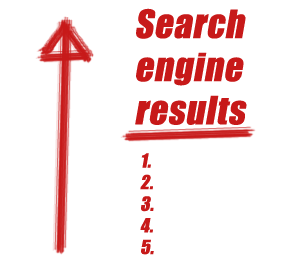 There are several factors involved in the way search engines rank and list websites in their results pages. Google, perhaps the largest and most used search engine, does not specifically tell webmasters what these factors are, but they do give us guidelines to follow in order to improve the page rank of our websites. On page SEO is the correct formatting and usage of tags on the pages on your site. For example, every page should have a unique title tag and a unique description tag which contain the main keyword(s) of that page. They should also contain at least one header tag within the body tag which includes the main keyword(s) as well. It is generally bad practice to over-stuff your web pages with the same keywords over and over. This may actually lower your page rank. Also, using a lot of pictures instead of text may also hurt your page rank. The reason for this is because major search engines often crawl through the actual text on your pages to determine what your site is about. If you must use images, provide search engines with a descritptive alt tag. Off page SEO includes strategies which are implemented off of your actual site. For instance, having inbound links to your webpage from an external website. Sites such as facebook and craigslist are excellent for inbound links to your website and can deliver much desired traffic. Search engines, software "robots" which crawl the internet, go from website to website following links and indexing the pages. The more inbound links a website has, the higher the page rank will usually be. By getting high ranking websites to link to your website, you increase the page rank of your own site. Good SEO is a combination of both on page and off page SEO. Having your site well formatted will ensure that it is indexed for the proper keywords. Having high ranking inbound links is the best way to drive traffic to your site. This combination will increase your page rank, and the position of your site in search engine results. Don't lose focus on what is really important, customer experience. Keep your website with fresh, up to date content. Try to create a favorable impression on your visitor, which will keep them on your site longer, and improve their overall experience. This is undeniably the best way to build your page rank. Proven Results, Increased Website Traffic! Session Data Over Same Three Year Period. Submit to Google and 300+ other search engines for only $3.49 at ineedhits.com!